Blackwing is my first published work and will be hitting US shelves in October. It’s available on Amazon and the other usual sites for preorder now. 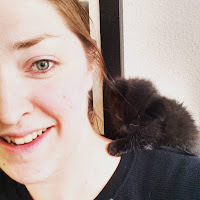 I also run a blog at www.edmcdonaldwriting.com and have had a number of guest-posts featured on blog websites during July. Ryhalt Galharrow is forty, a functioning alcoholic who has conflicted feelings about the things that he has done in the past. He’s not very honest with himself and wants to believe that he’s heartless because things would be so much easier if he could let things go. He’s a big guy, measured, not very friendly, but he’s deeply loyal to the few friends he can stomach. Oh, and he’s also in eternal servitude to an immortal called Crowfoot who exists as a raven tattooed on Galharrow’s arm, and whose method sending him orders is distinctly painful. I’m at work on the second instalment of The Raven’s Mark series, of which Blackwing is the start. It’s written, but I’m in the process of doing some significant editing to get it into shape. I’m also working on a few other projects including a YA post-apocalyptic novel, a screenplay for a sci-fii thriller and a script for a graphic novel. Those are all very much in their infancy though – book 2 is the priority. I love thinking about this stuff! Ray Stevenson is my main choice for Galharrow, in part because he’s 6’6 and Galharrow is a big guy. Alternatively, Mike Colter would fill the role pretty well. 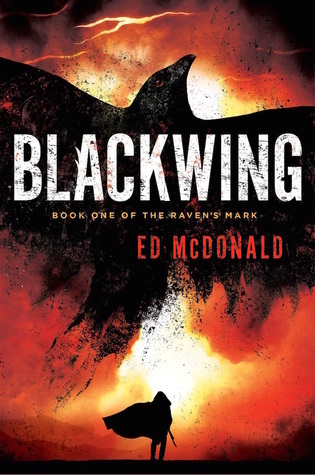 Blackwing is part of The Raven’s Mark series. Each book stands alone – there’s a full plot that has a resolution – but that all fit together into a larger narrative. I don’t get to read as much as I used to. If I’m mentally alert enough to be reading, then I feel compelled that I should be writing instead. But I still get through maybe a book a month. My favourite authors are probably Robin Hobb and Joe Abercrombie, but Joe better not see this because every time I see him I tell him that I’m stealing his place in the genre and I don’t want him knowing that I love his books. We did karaoke together in Helsinki recently, and he can sing as well as write good books. Grrr. Currently I’m reading Behind Her Eyes by Sarah Pinborough. I love fantasy but I find reading it difficult now, because I’m so hyper critical and deconstruct it all. I am also enjoying Jay Kristoff’s Nevernight – his prose are just brilliant. The last book I finished was Mike Carey’s The Girl With All The Gifts which was excellent. Don’t put up with anything that makes you less than happy. Always work harder to make your life better. Legend, by David Gemmell. It’s the only book that I’ve read seven times, and it literally changed my outlook on life. It still influences me today. The more you think about your book as a great work of art, the less you’re going to be able to make the important decisions. It is a great work of art, but the Mona Lisa still has the figure centered, there’s still a particular palette of colors used, and Da Vinci used a brush, not his fingers. Writing a novel is as much like building a car engine as it is about dreaming a landscape. The pieces have to fit together. Be practical and pragmatic and listen when people tell you that something isn’t working for them. Buy my book and read it! Or listen to the excellent e-book narrated by Colin Mace. I blog a bit about swordsmanship (which I train) and other writing related stuff. Thank you to Ed McDonald for stopping by the blog. I thoroughly enjoyed reading your answers and I can't wait for the next installment of the Ravens' Mark series.